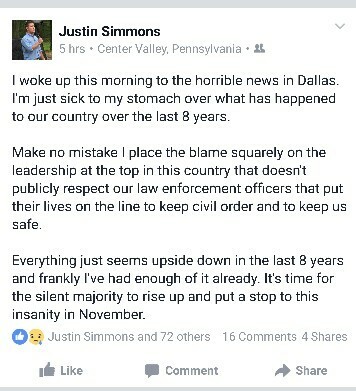 I woke up this morning to the horrible news in Dallas. I’m just sick to my stomach over what has happened to our country over the last 8 years. Make no mistake I place the blame squarely on the leadership at the top in this country that doesn’t publicly respect our law enforcement officers that put their lives on the line to keep civil order and keep us safe (sic). Everything just seems upside down in the last 8 years and frankly I’ve had enough of it already. It’s time for the silent majority to rise up and put a stop to this insanity in November (sic).